Our range of products include coin acceptor - programmable (jy923a), coin acceptor - programmable (jy926) and coin acceptor - programmable (dg600f). Are you trying to make a quick dime from electronics? Why limit yourself to dimes? This coin acceptor will take three different kinds of coin! Whether you're building your own arcade cabinet or just charging admission to your house, this programmable coin acceptor makes it easy to monetize your next project. Are you trying to make a quick dime from electronics? Why limit yourself to dimes? This coin acceptor will take up to six different kinds of coin! Whether you’re building your own arcade cabinet or just charging admission to your house, this programmable coin acceptor makes it easy to monetize your next project. The sensors in this coin acceptor use the thickness, diameter and fall time of the coins to identify them and it’s fully programmable so you’re not limited to any particular type of currency. Simply use the buttons and 7-segment display on the side of the unit to select a coin profile, insert a bunch of coin samples (or the same one, over and over) and you’re good to go! After you’ve programmed the coin profiles, the coin acceptor will recognize them and report when each type is inserted, rejecting other coins. 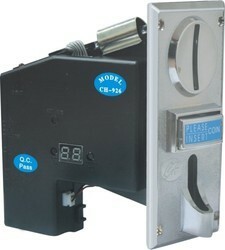 This is different from the Coin Acceptor - Programmable (3 coin types), since it has more built-in memory. Hence, it can accept upto 6 different types of coins. This is a cheaper version of the Coin Acceptor - Programmable (6 coin types) and it does not have serial communication hardware. Thus you wont find the serial or parellel port on this system. However, it has the standard pulse output, which can be programmed by the user. All that the system needs is a 12V power supply, and you can get pulses out from the pulse pin from the 4-pin header. These pulses can be read by an Arduino, AVR controller, or any other control circuit and implemented onto your application easily. New! 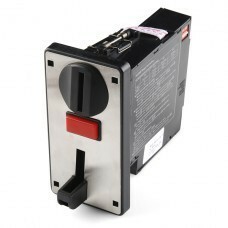 This coin acceptor now accepts thicker coins, since it has a wider openning. Thus, it can now also accept old Rs.5 coins! So maybe you won’t get rich building your own vending machines but access control using different sizes of tokens might be cool, or even a virtual vending machine where you can buy MMORPG items. There are a ton of cool coin-operated projects just waiting to be built! Are you trying to make a quick dime from electronics? Why limit yourself to dimes? This coin acceptor will take up to 6 different kinds of coin! Whether you're building your own arcade cabinet or just charging admission to your house, this programmable coin acceptor makes it easy to monetize your next project. The sensors in this coin acceptor use the thickness, diameter and fall time of the coins to identify them and it's fully programmable so you're not limited to any particular type of currency. Simply use the buttons and 7-segment display on the side of the unit to select a coin profile, insert a bunch of coin samples (or the same one, over and over) then designate the value. After you've programmed the coin profiles, simply read the serial output of the coin acceptor and it will tell you the value of each coin as they're inserted. It reports these values as binary bytes and the baud rate is selectable on the unit. 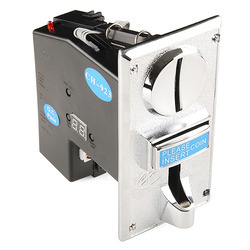 This coin acceptor also has a coin reject, so your controller can tell the coin acceptor not to take any more coins, as well as a (very loud) alert beeper. All you need to get the coin acceptor working is a pocket full of change, a 12VDC supply and somewhere for the change to fall after it's accepted.